Vegan Chai Spiced Smoothie Bowl recipe with Turmeric and Chia! Packed with healthy fats, anti-inflammatory properties, and full of flavor! 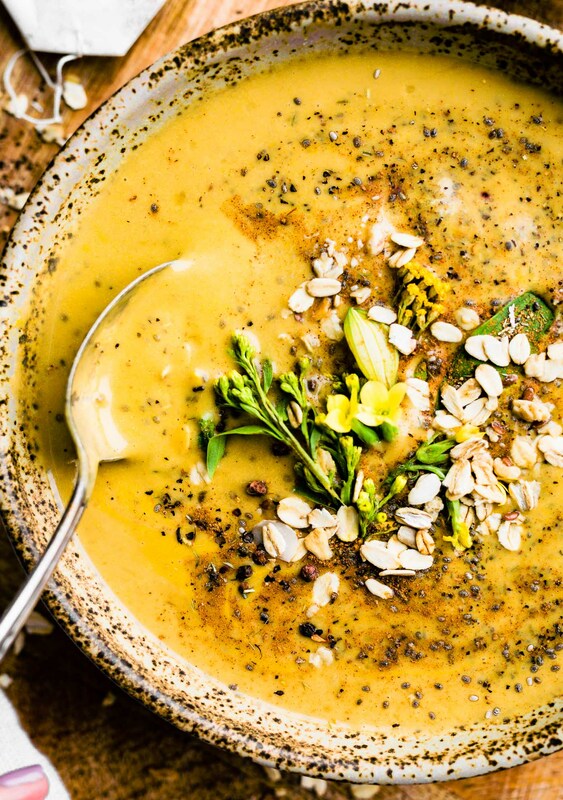 This golden smoothie bowl that will leave you feeling nourished and healthy. Gluten free and dairy free goodness! Howdy Friends! Happy Friday! it’s been a doozy of a week, so I thought we should end it with a little TLC in the form of anti-inflammatory smoothie bowl recipe. 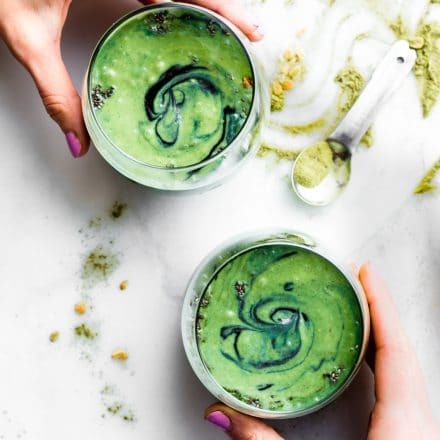 Because bowls are more fun and this smoothie bowl recipe is so cozy and soothing, you’ll want to sip on it all morning. I mean spoon with it all morning. Wink Wink. The truth is, if I (we) don’t take care and nurture ourselves (especially during times of stress), then we are useless for others. So let’s spend the weekend soaking up some extra rest (if needed) and extra nourishment. You might remember our obsession with Ginger Turmeric Lemonade. Yes, that’s still a favorite in our household, along with Turmeric Tea Lattes. Both recipes provide nutrients to help fight chronic fatigue and oxidation. The recipe I have for you today is no different. Same medicinal properties, but in smoothie bowl form with a little Omega boost (Chia seed) to thicken. What you need for an Anti-inflammatory smoothie bowl! Turmeric – Turmeric is a natural anti-inflammatory, antioxidant, antiviral, and is said to be 5x stronger than Vit. C as an immunity booster. It also protects the liver against oxidative stress. Which is probably needed after a night out on the town (if you get my point, haha). Chai Tea – Chock full of powerful anti-inflammatory and antioxidant agents. Also helps support digestion after meals with it’s combination of black pepper, ginger, and cinnamon spices. Don’t have Chai Tea available? This works well with just a blend of chai spices. 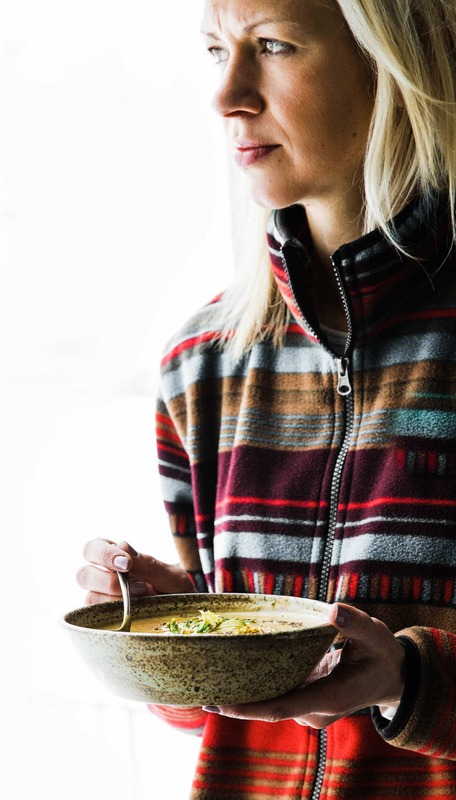 Check out my Chai Detox Bowl Recipe for that mix! Coconut Milk or Almond Milk – Dairy free, healthy fat (bonus if you add some coconut oil MCT’s ), satiating. Chia Seed – High in Omega 3’s (fatty acids), fiber, high antioxidant profile, and contain a good source of minerals such as calcium, magnesium, and manganese. For this recipe, you will first steep the Chai Tea and the Turmeric together in coconut milk. I used a large french press jar to do this, but feel free to use stove top. Same procedure at turmeric latte, just with chai added. Turmeric contains a compound called curcumin, a bright yellow chemical, which gives turmeric its golden colour. Curcumin is beneficial for its anti-inflammatory properties. Now here’s the cool part! 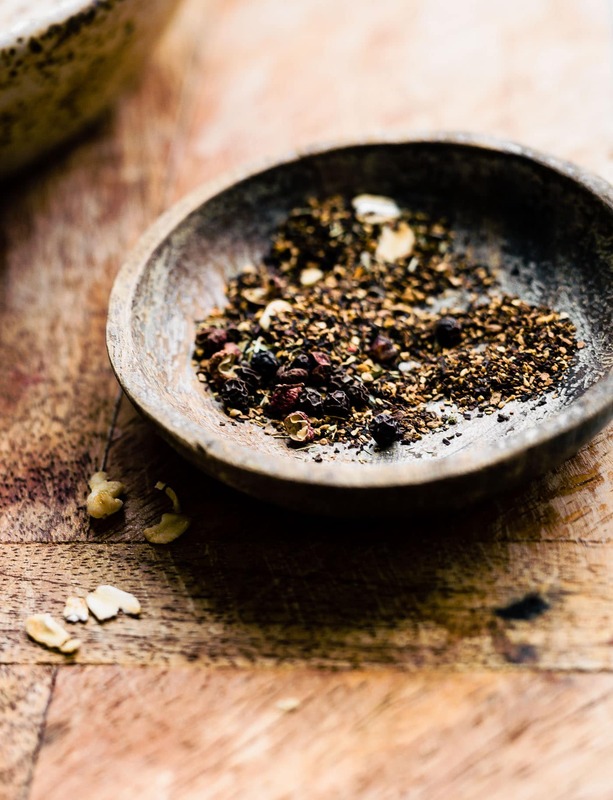 When you steep Turmeric with black pepper (used in the chai tea spices), it helps you activate more of the curcumin for your body to absorb and use. WOOHOO ! See, CHAI and TURMERIC are AMAZING! Now that we understand the nutrition aspect, let’s talk about smoothie bowl recipes. WHY drink a smoothie in a bowl and how? How to thicken a smoothie for a smoothie bowl! 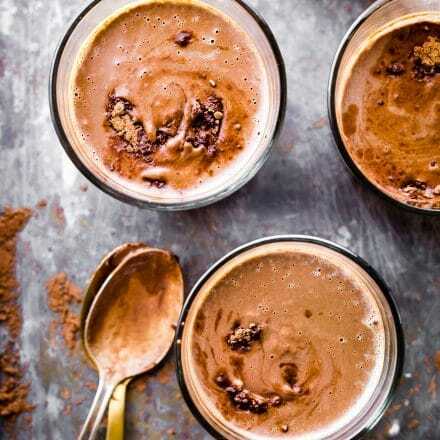 After you steep the chai and turmeric (and let it cool), you will then you blend it with almond butter, optional frozen banana or gluten free oats, and protein. Add a scoop chia seed, like you would would making a chia pudding or overnight oatmeal, then place the smoothie in the fridge for a few hours or overnight. During that time, the chia seed, banana, and the almond butter will help thicken the smoothie! Come breakfast time, all you have to do is pour the smoothie into a bowl and enjoy. Edible flowers n ot included haha! See, look at that smoothie bowl thickness. YASSS! 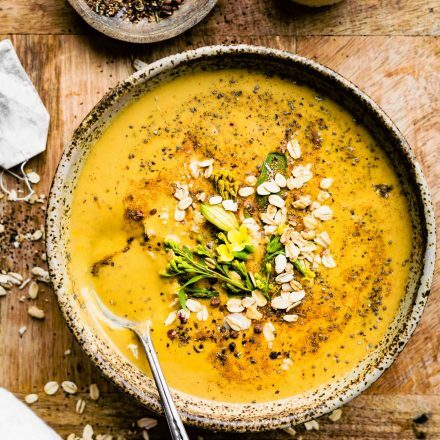 Vegan Chai Spiced Turmeric Smoothie Bowl recipe with Chia! Packed with healthy fats, anti-inflammatory properties, and full of flavor! An anti-inflammatory smoothie bowl recipe that will leave you feeling nourished and healthy. Optional protein – 1 scoops plant protein powder or collagen. First heat your milk on stove top or in microwave. Place chai tea, turmeric, and cinnamon in pot or heat resistant jar and steep for 3-4 minutes. If using stove top, let the milk come to a quick boil then reduce and simmer for 2-3 minutes, 4 minutes all together. Remove tea bags and whisk together. Place jar in fridge to cool and thicken; 1 hour up to overnight. Pour smoothie into 2 bowls and top with more cinnamon, and chia or oats (if desired). 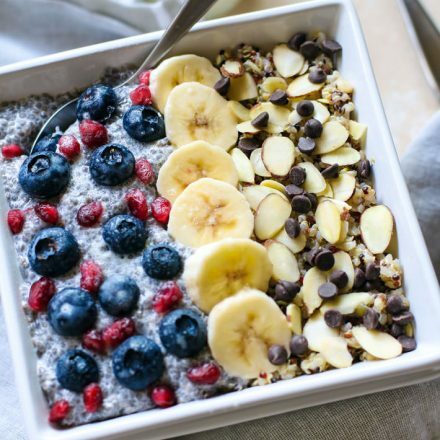 If you desire a smoothie bowl recipe with of more of a chia pudding like texture, then mix in one more 1 tbsp of chia after blending, plus oats or protein powder mentioned, and and let it sit overnight in bowls. For Whole 30 option– omit maple syrup and oats. I know what you’re thinking. Ugh, that a lot of waiting for a smoothie. But you know what the best part is? The heavenly smell and golden color! That, alone, will make you feel good and is worth the tiny bit of extra effort! 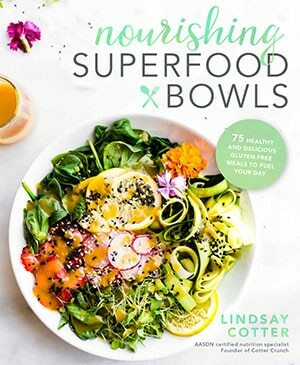 Favorite ingredients to make a smoothie bowl recipe? 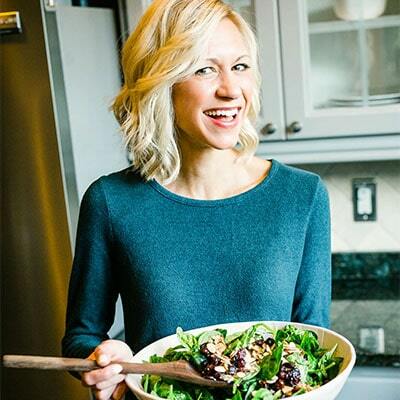 Bring on the weekend and all the anti-inflammatory recipes! 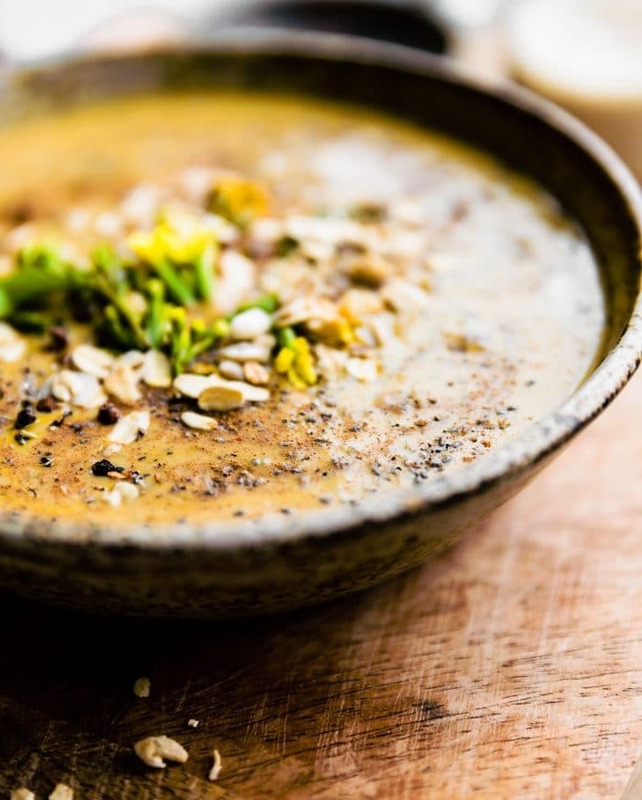 p.s Just letting you know this Chai Smoothie Bowl recipe was originally published in 2015. I retested, rephotographed, updated content and URL. Meaning, it’s BETTER THAN EVER for you today! I hope you enjoyed the new nerdy nutrition. 😉 . Thank you for following Cotter Crunch Y’all!. I have said to you a few times to make sure you follow your own advice, but I think we are the worst at doing that when we give out advice, sometimes I can be the biggest hypocrite, but we are all learning right? This sounds so wonderful Lindsay, especially for one of those chilly mornings, YUM! I think the things we know to be the truest are the exact things we have trouble with! That said, you are so right that we are useless if we don’t nourish ourselves, and I learn this lesson at least once per week it seems! This looks so delicious! I love chai spice in anything but especially a nice warming coconut chai latte. I feel like I’ve been saying that to people a lot recently–that you have to help yourself in order to help others. Like putting on the oxygen mask on the airplane–if you don’t, you will pass out, and then what good will you be? totally! i need a good slap of reality of that. So thanks suz! I hear you on the need to take care of and nurture ourselves. And this! Looks amazing. 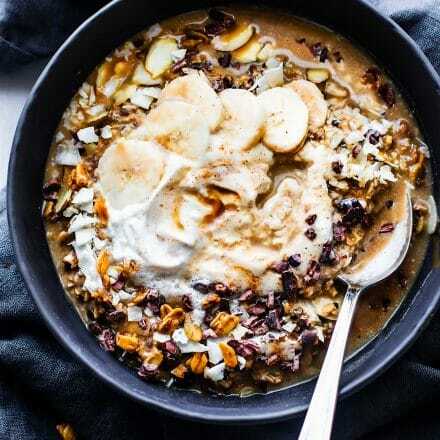 I love the flavor of chai and love the idea of including it in a smoothie bowl! I am not a chai person, but you may have convinced me to try chia is a smoothie bowl because it sounds so good! I love chai eeeeverything. This looks awesome! Is it wrong that I want to jump into this bowl of goodness and EAT my way out? I am obsessing over the perfect-for-fall chai flavor…and chia! Which also spells chai if you mix it up. There’s your useless fact for the day. Pinned! Oh gosh this looks so good–so unique too. I loooove love love chai and don’t drink it nearly enough. What better way than in a smoothie bowl?! let’s have a chai smoothie date! yay! did you follow it to a T? How long did it sit in fridge? Miss you. The colors are so beautiful!!!!!!! shall we call this breakfast soup? haha, that works! 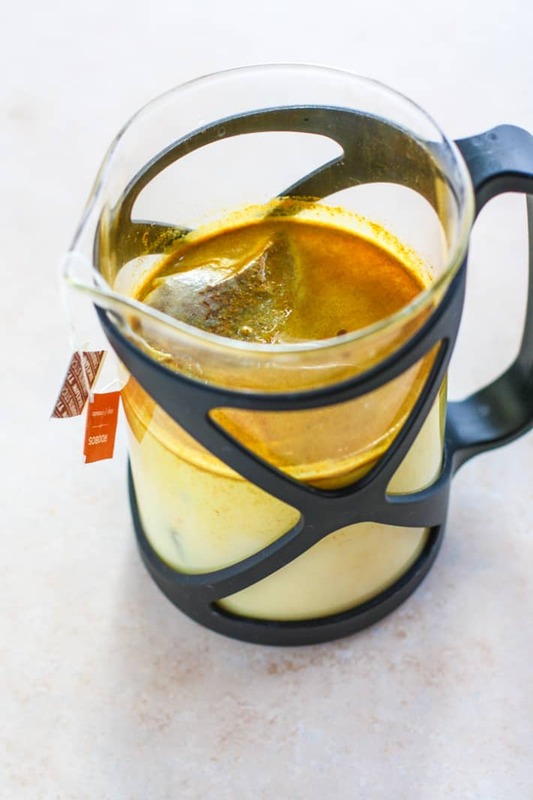 I didn’t know steeping turmeric in tea emphasized it’s good qualities – I so need to try this – this sounds delicious and just what I need! Normally smoothie bowls don’t appeal to me. For whatever reason, I like to drink mine, but this one is different. It looks like pudding and it intrigues me, in a good way. Also, I’ve said it before and I’ll say it again, I love when you talk nutrition to me. It’s hot. you’re hot! bow chicka bow wow! I would totally pull this out of my computer screen and eat it right now if that was possible. I haven’t had chai in years but it’s my favorite tea, and combining it with turmeric is genius! I’m a huge believer in the powers of turmeric. Checking out that Ginger Turmeric Lemonade as well! Rest up and recover, Lindsay, and I hope your week goes well! Love this! I just made a chai chia smoothie bowl last week and Sammie picked up a pumpkin tea to make a pumpkin chai one…. that will be on the blog. I’m going to have to try your version too! PS Love turmeric, wish I would have added it and another reason I can’t wait to try your version! these smoothie bowls look so refreshing and energizing! I could see myself having one of these after a workout! Yum! Uh oh, going to read your life events now. But in the mean time, hope all is well. Love me some chia seeds! 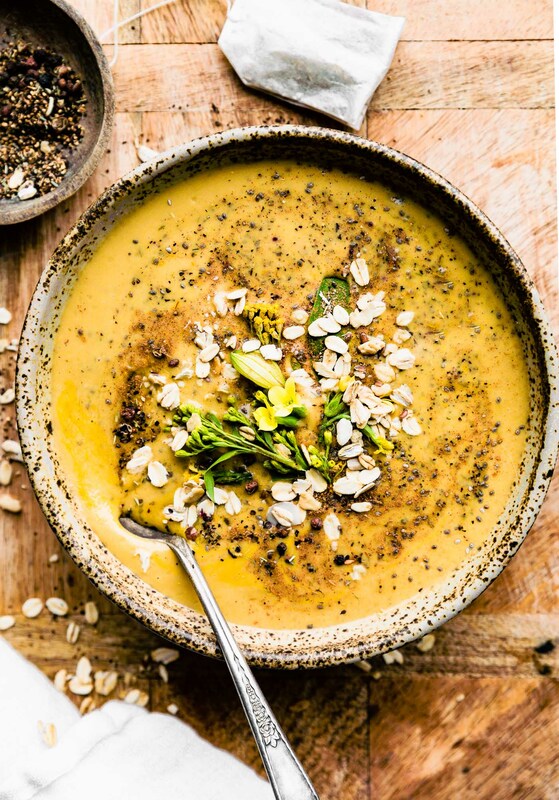 You know I love my smoothies, and this fall-inspired bowl is calling my name! YUM! Oh I am so excited about getting more turmeric recipes! I know how amazing it is for inflation in the body and have been trying to get it into our system more. We both love your ginger turmeric lemonade and will be making this for sure! Will go down the chia pudding route and probably won’t blend it – then again I love the chia blobs! Haha! While I’m not usually a smoothie person you had me at chai here. Starbucks should consult you to give their menu a makeover and include this. I like your nutritional break-down of the ingredients, too – I always knew chai was superior to all other teas ;). POUR SOME Vegan Chia Spiced Chia Smoothie on MEEEEEEEE… In the name of loveeeee! this recipe screams fall :)! Coconut milk to smoothies…life changing! I love the addition of turmeric to the chai spice! I’ve never thought to do that before. And I think we could all do with a reminder to take better care of ourselves. I know I could. Never thought to add turmeric to a smoothie before…but I made this today and it turned out SO well! I’m a total convert. The hardest part was waiting for it to set up with the chia seeds because it was so good! I kept licking the spoon! Will definitely be making it again! Dear Lindsay, A friend and I were just discussing how important it is to nurture oneself so that we can nurture others. An excellent book I read this summer about that is “Gift from the Sea” by Anne Morrow Lindbergh. This bowl of goodness looks like pure nurture and deliciousness. Pass me a spoon! love that! I must look into it! Yum!! I want to slurp this whole thing up. I love the addition of tumeric. Getting the ingredients to make myself one this weekend! I am not a chai tea person per say, so I feel kind of silly asking this. But chai tea comes in bags? And I will be using organic coconut milk from a can (unless you say something different), will a tea bag steep in that? Can you please clarify this for me? I am really wanting to use tumeric more, and benefit from the anti inflammatory properties of this recipe. yes! you can use the chai tea bags. So easy. I brewed in hot coconut milk from silk brand. But you can use the can, might be thicker though. I would try to find the light version. Keep me posted! This recipe was meant for me. chai , chia? absolutely making this. Thanks for sharing! Well worth the wait for this gorgeously golden smoothie! Right? Plus you get that golden glow. LOL! 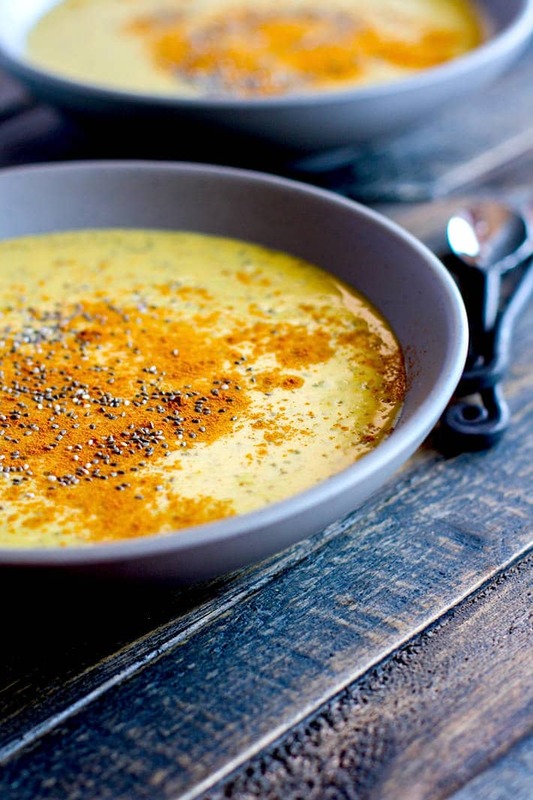 Give me ALL the turmeric recipes – especially this one. I love chai but not turmeric so much even though it has great health properties. I like all the other ingredients in this though so I’m determined to love it all together!